One legendary rock musician. An 80 piece orchestra. 2 worlds. 4 amazing days. Meeting at Abbey Road Studios some seven months before the show at the Royal Albert Hall, the journey began. Jacky Paice and Cat Simms from the Sunflower Jam charity were embarking on a huge project to create a night that would celebrate the life and musical career of one of rock’s pioneers; Jon Lord. The brief was not only produce a concert film that would capture the emotion of the show but to also film an accompanying documentary that would tell the story of the week leading up to the event. Fast forward to April 2014. Three cameras, one sound recordist and two rehearsal venues to cover. We spent the first day of filming at John Henry’s rehearsal studios in London. Musical directors Wix Wickens and Paul Mann had gathered together a group of amazing musicians to begin the run through of the show’s set. Amongst others, Micky Moody, Neil Murray and Murray Gould had all given their time and talents to the Sunflower Jam’s shows over the years. It was the first time they had all been back together since Jon had passed and his memory and presence seemed to be felt in every note played. 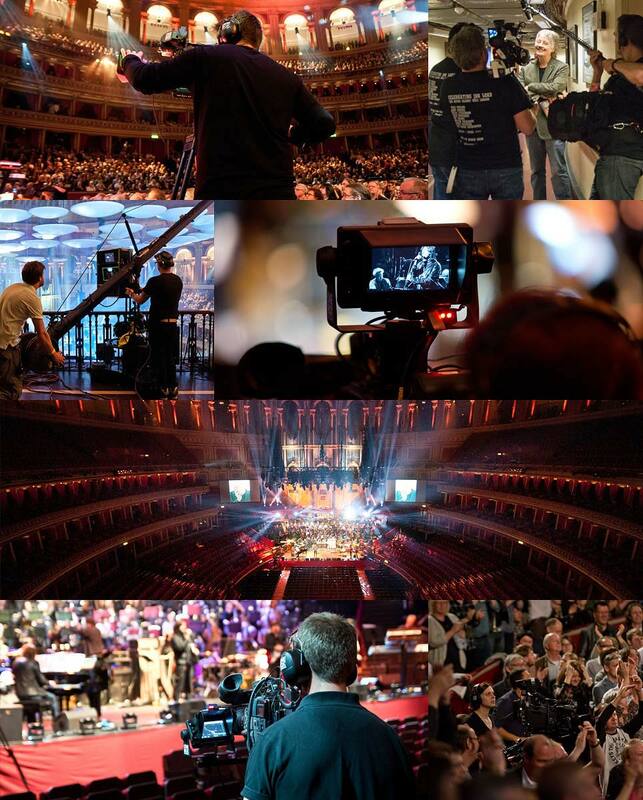 Our filming across all three days of the rehearsals swung between covering performance, reality and interviews captured on the edge of the action. The way we approach such filming is to try to become part of the crew. We try and film what we need but are always respectful that the musicians are there to do their own job, not to be at a film crew’s beck and call. For this project everyone was prepared to have a chat so that we could paint the picture of the project with depth. Morning of day two of rehearsals found us laying down the wally dolly in St Mary’s Church, Marylebone to capture the first orchestral rehearsals. The show was split in two halves; the first half celebrated Jon’s orchestral work, the second his rock music. Paul Mann was conducting the Orion Orchestra, a collection of the county’s most talented young musicians that regularly tour with Rick Wakeman. An orchestra is a beautiful thing to film. Like a huge jigsaw puzzle each piece, each section fit together to produce an amazing picture. With our dolly gliding along the bowing of the strings and our C300s working wonders in the natural light of the old church, we also recorded a commentary of the rehearsal through Paul Mann’s radio mic. This wasn’t just a rehearsal, Paul regaled the musicians with histories and anecdotes of his time with Jon over the years they worked together. This is gold dust for the documentary maker as it provides an instant voice over and narrative for the final film. The afternoon saw us back at John Henry’s to film what would become one of the main sequences of the documentary. Glenn Hughes and Bruce Dickinson met to rehearse the two songs they would perform together. It soon transpired that they shared a similar range and singing style. This led to an interesting story thread which we were able to follow from the initial meet to the following day’s full show rehearsal and into the Albert Hall itself. How would their voices work together, and what would the final performance sound like? We had began the project with a loose shooting script and a rough idea of the narrative of the documentary. As well as this planning we also needed to look for story lines that could develop within the framework of what we were filming. Bruce and Glenn’s sequence is one of two within the documentary that really jump out as narratives that grew while we filmed. (Watch this sequence at the top of this page). The other sequence centred around the song ‘Pictured Within’ (see clip at bottom of this page), written by Jon almost as a love letter to his life, friends and family. This thread began to take shape on day three of rehearsals when we returned to St Mary’s. It was the day that orchestra and rock came together and the two worlds collided. Miller Anderson, the original vocalist on Pictured Within was singing the song at the show. A palpable change in atmosphere in the church could be detected as the cello played the introduction. Artists, musicians and crew seemed to hush and begin to reflect on the man whose memory they had come together to celebrate. For the documentary it was the perfect soundtrack over which to hear people’s thoughts and recollections of Jon. The sequence ends with the show’s backing vocalists, all close friends of Jon and his family, in tears at the rehearsal. No words are needed to convey the fondness and love that was felt in the room at that moment. Fade to black. The show day was a huge logistical and creative challenge for us. A 12 camera shoot including 2 jimmy jibs and a crew of amazingly talented operators needed to be rigged. Whilst Richard Stevenson’s One Box Television set the shoot up, Jez Mason looked after the documentary team. Interviews with Bob Harris, Jeremy Irons, Glenn Hughes, Rick Wakeman and others were augmented with coverage of the set up in the hall, exterior shots of the venue and other general build up atmosphere. The opening sequence of the documentary was filmed as a nervous Paul Mann paced the back stage area of the Albert Hall before being introduced on stage by Bob Harris. For the show itself the gallery was situated directly underneath the stage in the less than glamorous environment of chair stacks, pipes and plumbing. All cameras were racked and recorded down below. Director Tim Sidwell, Vision Mixer Rod Wardell and show caller Ellie Verkerk led the crew to produce the footage for not only the end film but also for the audience screens in the auditorium. Once the dust had settled on the event itself, all that was left to film was a day of pick up interviews at Ian and Jacky Paice’s house. Celebrating Jon Lord was released through EarMusic in September 2014 and went on to become the number one music DVD in the UK, Germany, Austria and Sweden and top ten in a number of other countries.